Man, am I in a bad mood today. I’ll spare you the details. And there’s only one answer for that: cats! Big ones. On the left, I figured I’d show you the pillow/pod combo that I mentioned last week as a distraction to keep Domino off my desk. It was working pretty well until yesterday, when she suddenly seems to have decided it’s no longer a favored snoozing spot. Not sure why. Hopefully it’s just a passing thing. On the right, Inkblot is inhabiting a box of tissue paper that a few minutes before was a box full of Christmas ornaments. A few minutes later it was a napping spot. Festive! Speaking of which, a regular reader emailed this morning to remind me that next Friday is (a) Christmas and (b) a Friday. 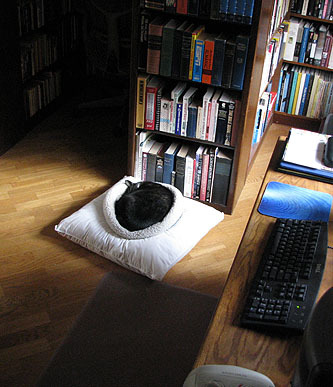 I’m not really planning to blog that day, so how about a catblogging extravaganza instead? 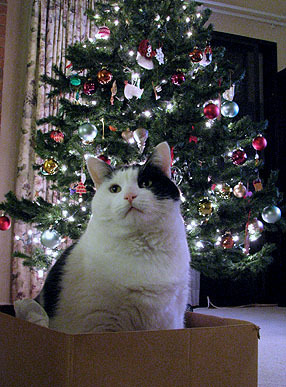 Send me a Christmas-themed photo of your cat, and I’ll post a bunch of them next Friday. In fact, since I’m actually a secular liberal Christmas-hater underneath my mild exterior, you can also send me Hanukkah cats, Kwanzaa cats, Eid cats, or just plain old holiday cats. Just make it festive somehow and your cat can be famous! I’ll post a dozen or so of the best. My email address is calpundit@cox.net.